This year’s 49th Goodna Jacaranda Festival in Ipswich from Wednesday 26 to Sunday 30 October, is packed with activities for the whole family. Goodna Community Board President Mathew Taylor said, “this year we have something for everyone and we are very excited with the events being showcased”. The event began in 1967 with proceeds initially shared by the local school and it has continued to grow each year. Ipswich Deputy Mayor Paul Tully added, “with this free community event attracting up to 30,000 people over three days, it is fantastic for the local community, I would like to thank the dedicated group of volunteers who put on this event each year’. 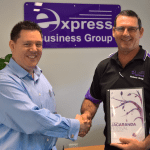 A free franchising seminar to kick off the Jacaranda Festival on Wednesday night October 26 will take place at the Metro Hotel Ipswich International from 6pm. Mayor Paul Pisasale talking to potential small business franchise owners about the strengths of business in the city of Ipswich. This event encourages people who would like to work for themselves to learn more about franchising in Australia, an industry worth over $144 billion dollars a year. 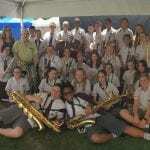 Enjoy the School Choirs, Jacaranda Bowls Tournament, Ipswich local rock band, ‘Crashing Tomorrow’ will entertain the crowd on Friday night and your chance to party under the stars. You can also enjoy Rides, lots of food, coffee, and treats, with this year’s event having lots on offer across the big three days. Saturday Night October 28, don’t miss Aussie Icon Shannon Noll performing live from 8pm on the main stage. Shannon who was an Australian Idol runner up and is best remembered for his number one song ‘What About Me’. His legions of fans love his pure emotion and find him instantly relatable. A Fourth album, A Million Sun, stays faithful to his classic rock roots while ramping up the pace like never before. Look forward to his greatest hits and new material during the show on Saturday night. Following Shannon Noll the Sky will light up with a Bang for the Biggest Fire Works show yet to be seen. Other artists performing include, Suit Collective, The Hames Trio, Sling, Moreton Dance Academy, and the Western Moreton Country Music Association. The Quest for Talent is on again showcasing great local talent. Alchemy Street Choir will perform, Chloe Adamovis, the School Band competition, and Heather Robinson to keep the weekend flowing with lots of entertainment and activities. All information is available from the website. The Jacaranda Car Show kicks off Sunday morning for Car Lovers and always attracts lots of interest, plus Rosanna’s Dance Academy, Aussie Bush Poet and Barefoot Brass. If that wasn’t enough, there’s the first every Jacaranda Halloween Quest, with a host of prizes for the best costumes on the night.